When I was commissioned to make a set of placemats to match a wedding registry dinnerware set (Orange, Jade, and Cocoa Custom Placemat Order), I kicked off an obsession with the color orange! I stopped by Joann Fabrics on Saturday to pick up a few essentials (thread, some Kona solids), and I noticed they were having a really great deal on their fat quarters. 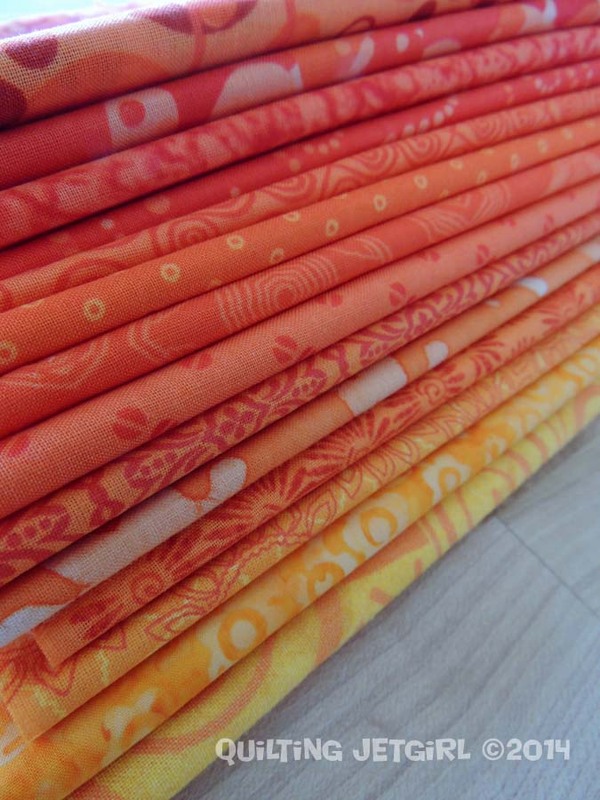 Well, I couldn’t help myself and walked out with 12 beautiful orange fat quarters. I don’t have much orange left in my stash, but I pulled what I had to compliment as well. I wanted to play heavily to the ombre / gradation effect of these fabrics, so I scoured around for a pattern that I wanted to use with these lovely’s. 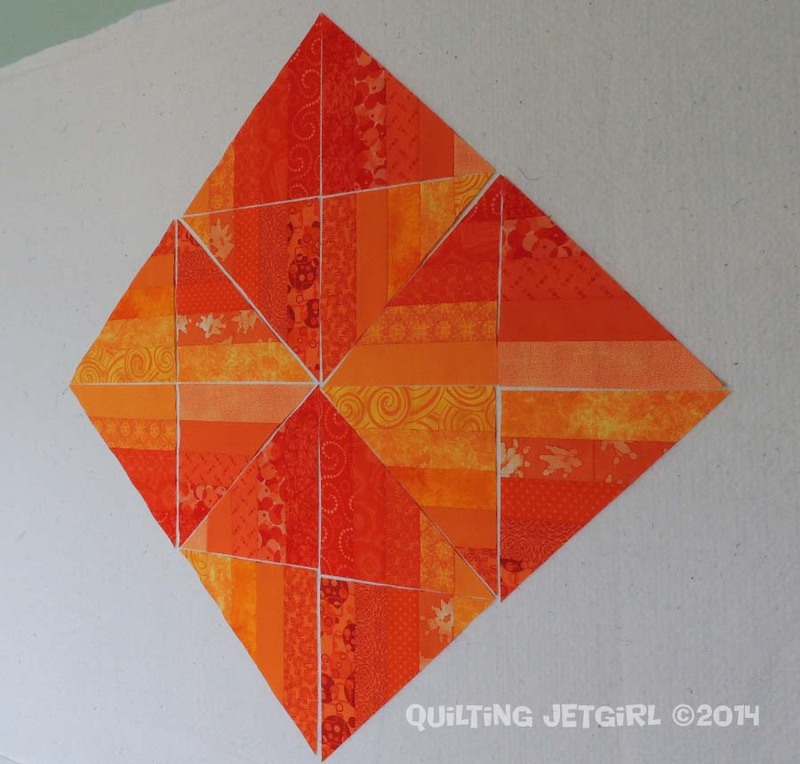 I came across the Blended Scraps Tutorial from she can quilt, and with Leanne’s description of using fat quarters for the process, I knew I had found the perfect design. I spent Sunday afternoon cutting an initial series of 2″ by 18″ strips and started grouping by color value and sewing. By the end of Sunday I had used each of the 20 fabrics once and started arranging them on my design wall. I woke up on Monday and dove right back into making blocks. 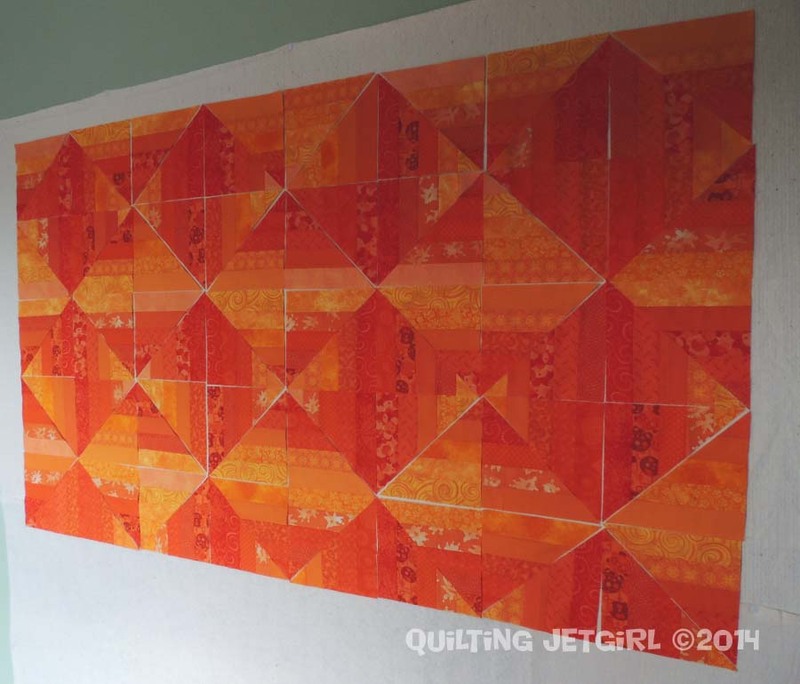 I had only cut strips to use each fabric three times, which equates to about a third of the quilt top that I am aiming for. There is one color grouping that has very little gradation, so I decided after taking the photo above to pull it out of the “light” groupings to keep the color variation a bit more pronounced. 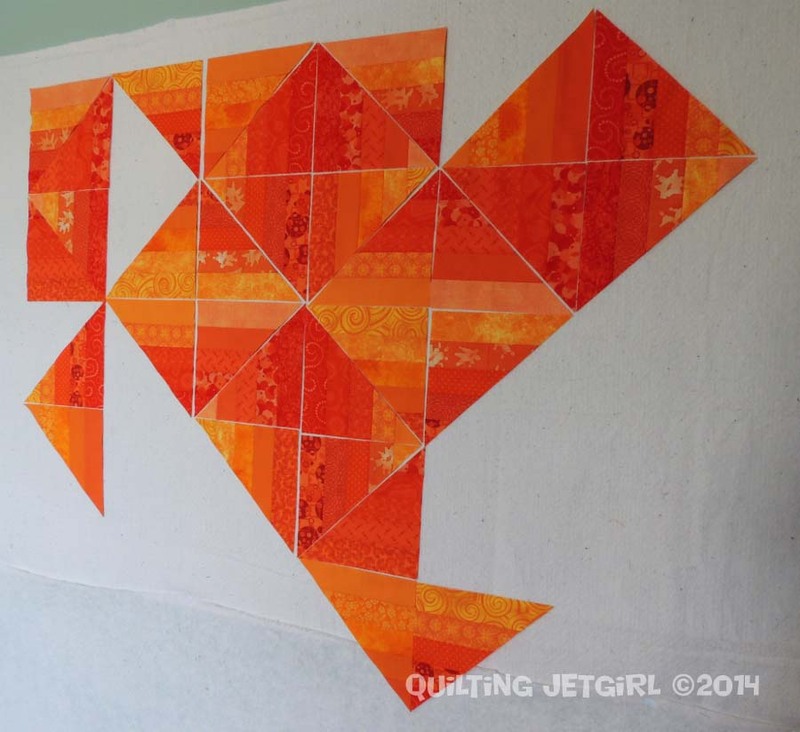 I do have a serious crush on orange, because I was so excited about cutting fabric that I got all of the remaining fabric cut and a serious amount of piecing completed as well! The lighting in my sewing room has been a bit off today. It has been overcast and humid here, and I have been hoping to get a bit of rain (because we so desperately need it out here), but no luck on rain, yet. 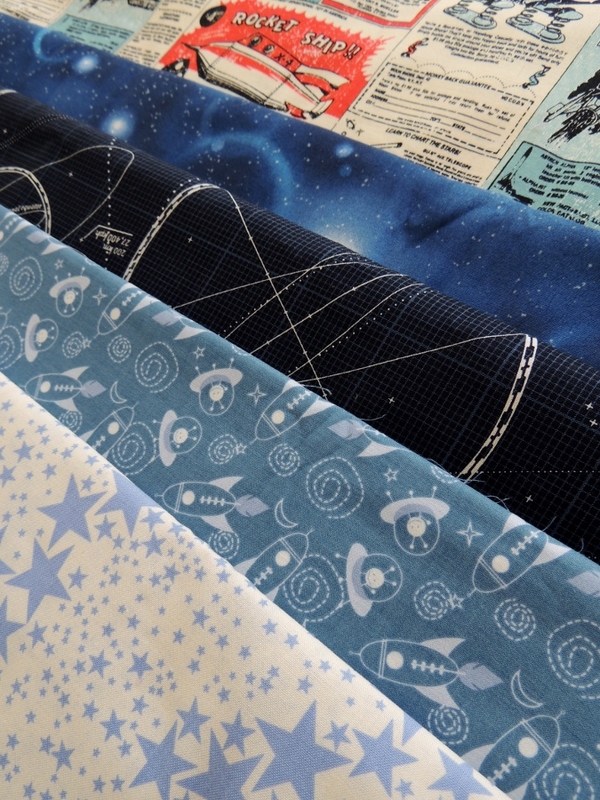 In other project news, I received the fabric order for Space Age Tumbling Blocks on Monday as well. Once I get the Orange Crush top pieced, I think I’ll be glad to set aside the orange for a while to work with this fun fabric! Love the oranges, love the tute it leads to! Thanks for posting all of that! Orange has always been my favorite color. It is such a happy color. I love your quilt! Not typically an orange fan, but those fabrics work well together. And those placemats are great!! Love this pattern! Can’t wait to see how it comes out! That is seriously lot of orange but I like it. I would fade into next colors for the edges though. For now it is yummy. 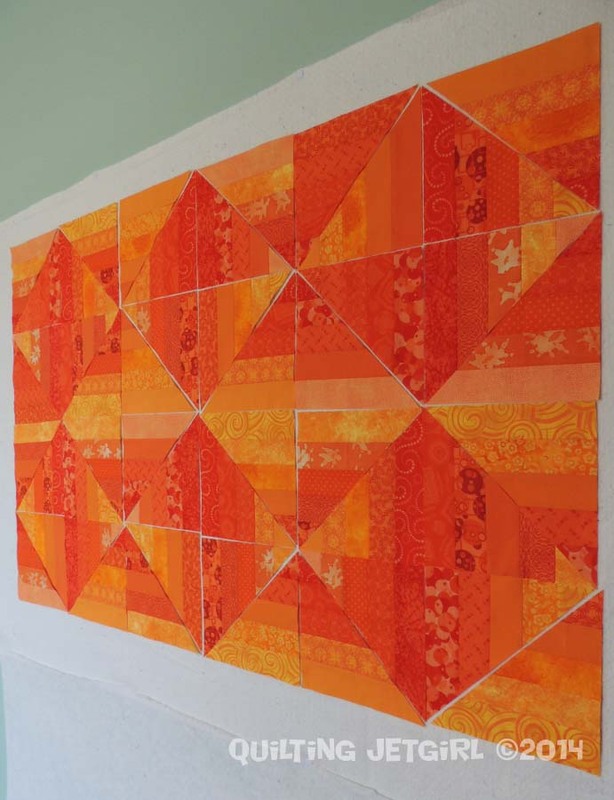 What a treat to click through from Bloglovin and get to see so much progress on your Orange Crush quilt. Great palette! And that Space Age project will be so much fun to work on. 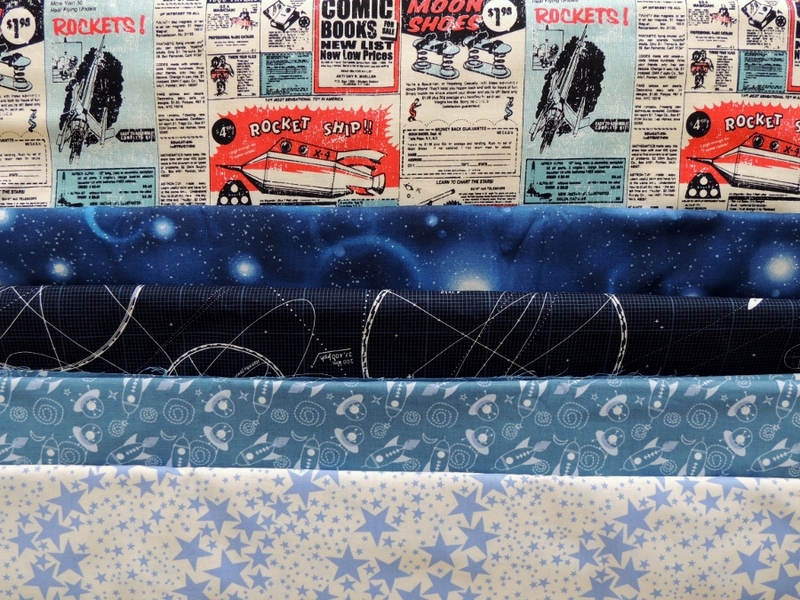 I love the Rocket Ads fabric. So unique! I do love the orange gradients. That is going to be some beautiful placemats! Oohhhh, both of these are going to turn out fantastic! I love this pattern for orange! That is an intense amount of orange! You chose some lovely fabrics, and this is a great pattern to use them! That’s going to be a killer quilt! Love how you’ve arranged the fabrics. Funny I’m not a super big orange fan, but I am loving what you’re doing. I think the range of color is wonderful. It looks like a beautiful sunset. Yes, I am def. thinking Denyse, if I can pull the light to dark range I need. What do you think? I wonder how these squares would look in a 2.5 inch strip arrangement? Might be worth a try.